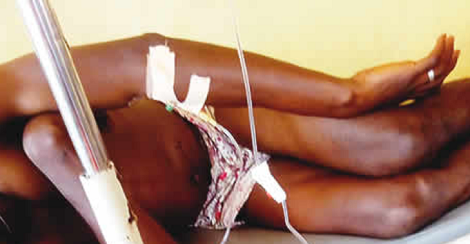 A farmer in Ubulu Uku community, Delta State, Ijeh Chukwuedo, is recuperating at the Federal Medical Centre, Asaba, after undergoing a surgery to remove bullets allegedly lodged in his stomach and thigh. The 23-year-old was reportedly returning home from his farm on Sunday when a drunken policeman, identified simply as Sergeant Emeka, gunned him down along Ubulu-Issele-Uku Road. Punch Metro learnt that Emeka and two other policemen had wanted to pick up Chukwuedo over N15,000 wages he collected from a man, identified as Funaya. The cops were said to have been led to the scene by Funaya. It was learnt that the policemen and Funaya stood by the roadside waiting for Chukwuedo to emerge from the farm. Punch correspondent gathered that the moment Chukwuedo, who was riding a motorcycle, surfaced, Funaya alerted the cops. He was flagged down, but he reportedly attempted to evade arrest. When it appeared that they might not catch up with him, Emeka reportedly opened fire, which hit him in the stomach and thigh. A resident, who did not want his name in print, said Chukwuedo was rushed to a hospital while the trigger-happy policeman was arrested. Chukwuedo was said to be asleep when Punchcorrespondent demanded to speak with him on Tuesday. However, the Coordinator of a human rights body, Behind Bars Intervention, Harrison Gwamnishu, told Punch Metro on the telephone that Funaya had contracted Chukwuedo to work on a farmland. He said Funaya gave the victim N15,000 for the work, which he failed to complete as agreed. The coordinator stated that Funaya, in company with a friend, Tochukwu, confronted Chukwuedo on Saturday and asked him to refund the money. Gwamnishu said, “They had Iwu festival in the community on Saturday. Funaya and Tochukwu went to Chukwuedo’s house to collect the money. Chukwuedo said he would not refund the money since he had already started the work Funaya gave him and promised to complete it after the festival. “He said Tochuwku angrily asked him to pay the money and he scolded him for meddling in a matter that did not concern him. The disagreement led to a fight. “The following day, Funaya led some policemen to arrest Chukwuedo and they waited for him to come out of his (Chukwuedo’s) farm. As he came out from the farm on his motorcycle, they asked him to stop. Gwamnishu said the victim’s family had spent about N50,000 on his treatment, adding that the police only sent N10,000 as medical bill. “They have not come to check him at the FMC. The policeman that shot him should be punished accordingly. He is a drunk and is not fit to be carrying a gun,” he added.